My parents sent me plans for a really interesting tiny house I could live in brick oven to build outside. I think my dad wants some bread, huh? Now I just need to rip up the brick streets of Seward for supplies! 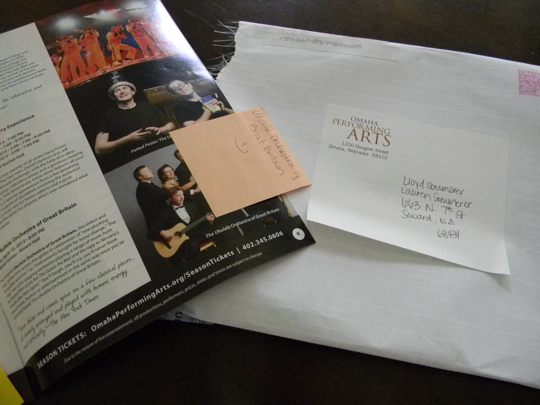 Another envelope held a Special Early Bird Pricing packet from the Omaha Performaing Arts Council inviting our ukulele group to buy tickets early to the Ukulele Orchestra of Great Britain. (Warning, there is a tiny swear in the song – d*mn – in case you are in a place where that would be frowned on, but the uke playing is phenomenal!) I feel a little dishonest keeping it, as it’s been well over two years since I’ve gone to a get-together. I sent an e-mail about it to the Ike group’s fearless leader, but I do still have this information…… Want to go to a concert next April? Fun stuff! That is why it would be a tragedy to end Saturday mail delivery! 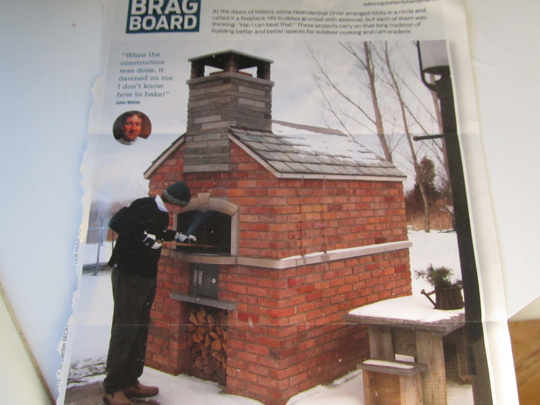 In the picture of the brick oven, I saw the top part as saying: Brad Borg. That’s what I would call myself if I were assimilated by the Borg. And thanks for the Ukulele link….it led me to this guy! Why did I never hear of him before? He is awesome!! Could you make Runzas in that oven? But I searched here and see you’ve posted a few times about them. I just didn’t know what you were talking about. If I were to describe a Runza, the first thing that comes to mind is hottest (temperature-wise) food on the planet. That meat-and-cabbage mixture gets wrapped up in bread dough, baked and retains its heat. I always have to break mine open and eat half my fries before I even begin. To answer your question better, I think I could bake Runzas in it…. using baked Runzas as fuel! Egads! I’ve invented a perpetual baking machine!